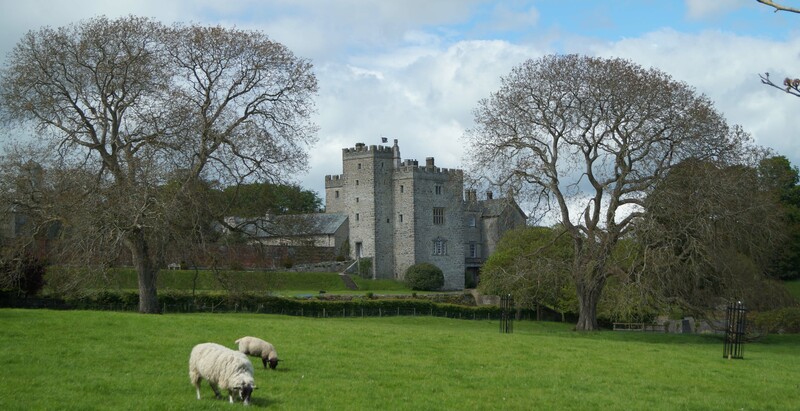 Sizergh Castle, which was originally known as Sizergh Hall, was built by the Strickland family in the early fourteenth century. The castle was substantially expanded in the sixteenth century and, despite participation in the Pilgrimage of Grace and supporting the Jacobite cause, the Strickland family retained ownership until the twentieth century. Sizergh was granted to Gervase Deincourt between 1175 and 1180 by William FitzGilbert (also called William de Lancaster). The manor remained with the family until 1239 when Elizabeth Deincourt, great grand-daughter of Gervase, married Sir William de Strickland. Precisely what form of building stood on the site at this time is unknown but presumably included some form of manorial house or hall. However, the Strictland family seat was at Castle Carrock, near Carlisle, and Sizergh was at the extremity of their estates making it something of a backwater. 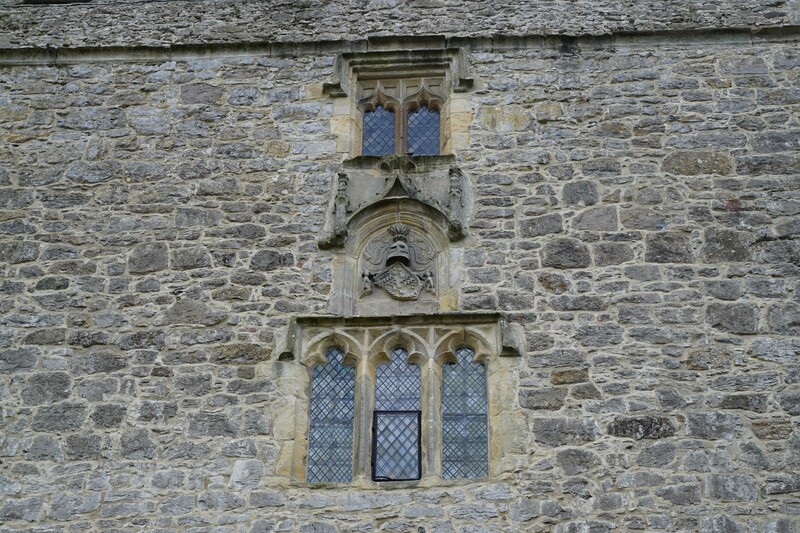 This changed during the course of the thirteenth century when the family became major landowners in Westmoreland. By the fourteenth century, these expanded holdings required a more centrally located caput and the then owner - Walter de Strictland - opted to develop Sizergh. 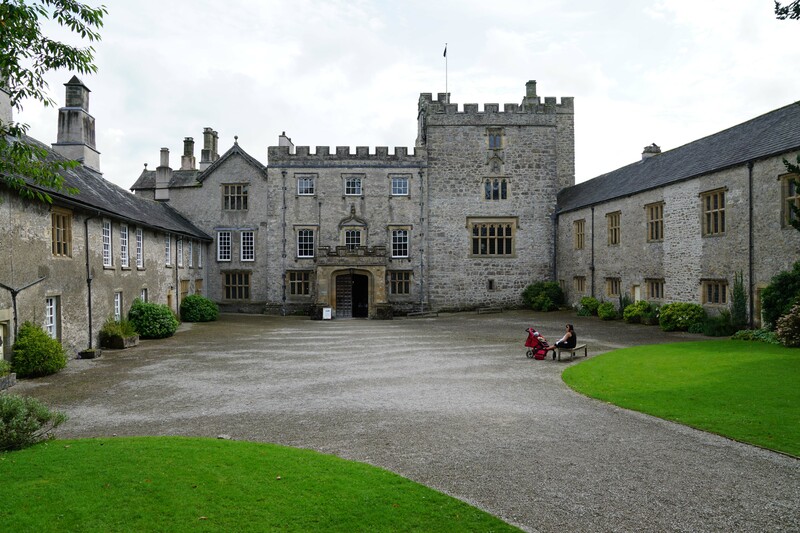 Accordingly between 1310 and 1360 he constructed Sizergh Hall (the site only became known as castle in the nineteenth century). The earliest part of the new facility was a single storey Hall Range which was originally accessed via an entrance on the east side. No later than 1343, a four storey solar tower was added that was connected to the hall on the south side. It was constructed from limestone rubble and is one of largest examples of its kind in Cumbria; evidence of the wealth of the Strictland family. A smaller service range, built at the northern end of the Hall Range, was added at this time. The adjacent lands were enclosed into a park in 1336. The Strictlands supported the Yorkist cause during the Wars of the Roses including fighting at the Battle of Tewkesbury (1471) after which the then owner, Sir Thomas Strickland, was knighted. Nevertheless, the family survived the defeat of the Yorkists by Henry Tudor and they went on to prosper in the service of Henry VIII despite Walter Strickland becoming embroiled in the Pilgrimage of Grace, a major northern rebellion against the King. He was pardoned and went on to make substantial modifications at Sizergh. He added an attic to the Hall Range and converted the Service Range into a three-storey tower. He also built the North and South Ranges. The former, which may have been built over an existing structure, hosted the ancillary functions of the castle including kitchen and stables. The South Range was used for high status accommodation and incorporated a long gallery. The entrance into the Hall Range was relocated to the west side at this time. The Strickland family supported the Royalist cause during the Civil War. Following the war they were able to retain their estates but had to pay substantial fines. They also remained loyal to James II after he was deposed and, for a number of years, went into voluntary exile with the former monarch. The family avoided confiscation of Sizergh by the State by means a series of trusts. 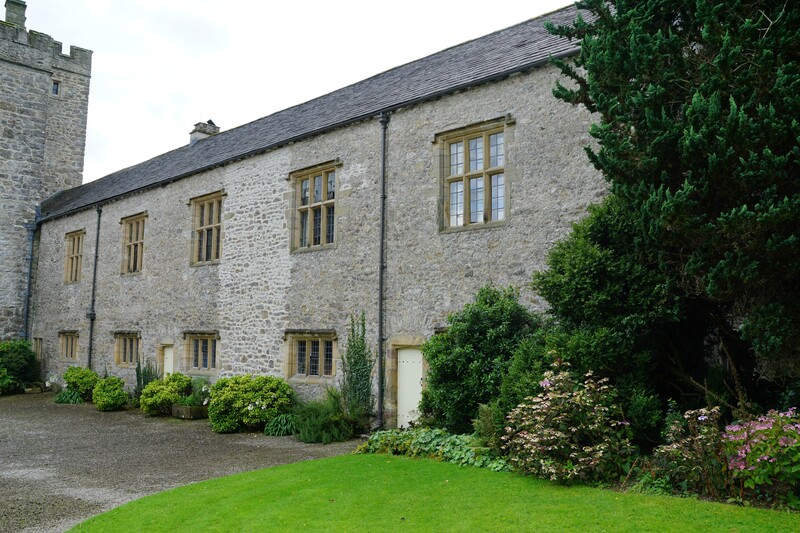 These legal measures also stabilised the Strickland's income enabling some modest upgrades at Sizergh between 1670 and 1770 including enlargement of the Hall and re-roofing the Solar tower. Between 1770 and 1780 Cecilia Strickland heightened the Hall Range into a three storey structure. Sizergh was gifted to the National Trust in 1950. Cope, J (1991). Castles in Cumbria. Cicerone Press. Emery, A (1996). Greater Medieval Houses of England and Wales. Cambridge University Press, Cambridge. Ewbank, J.M (1963). Antiquary on Horseback. Goodall, I (2000). Sizergh Castle. Historic England (2015). 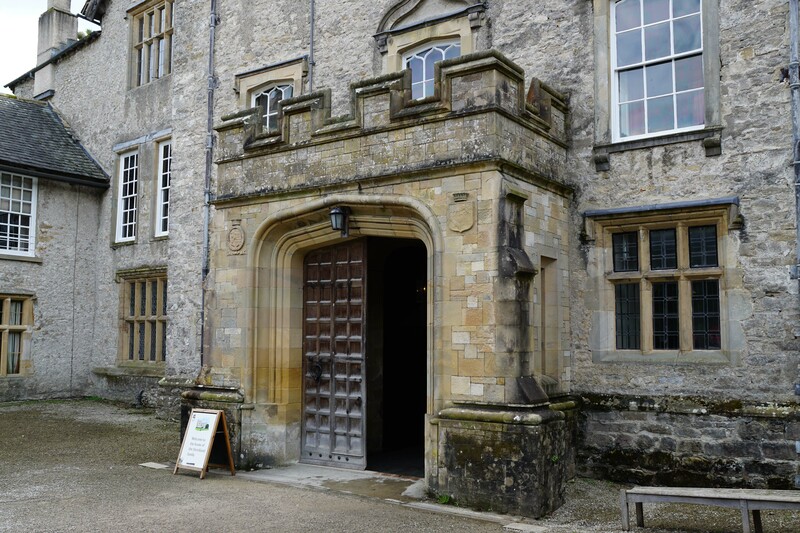 Sizergh Castle, List entry 1318962. Historic England, London. Hornyold, H (1928). Strickland of Sizergh. Hornyold-Strickland, H (1970). Sizergh Castle. Jackson, M (1990). Castles of Cumbria. Carel Press & Cumbria County Library, Carlisle. Salter, M (1998). The Castles and Tower Houses of Cumbria. Folly Publications. 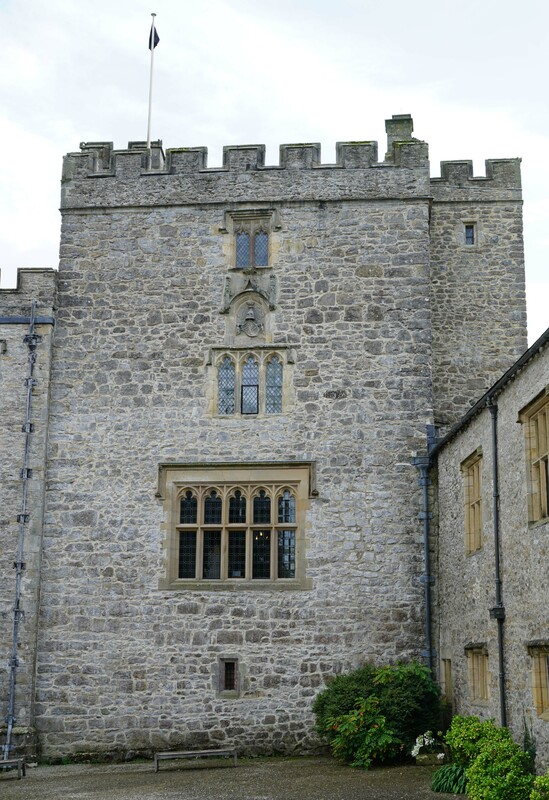 Sizergh Castle is a well preserved example of a gentry-status residence. It is in the care of the National Trust. 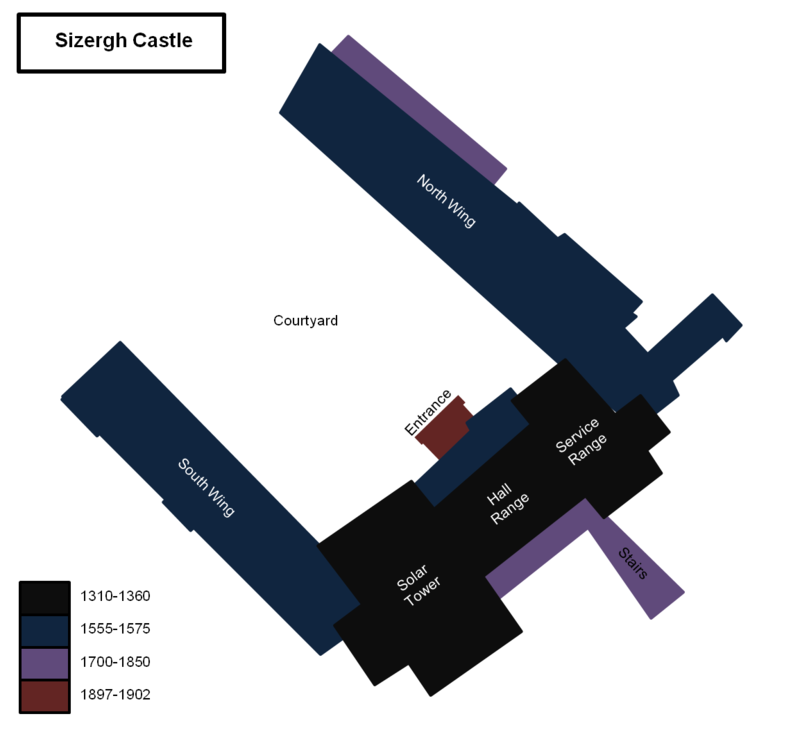 Sizergh Castle Layout. The earliest structure was the Hall Range but this was soon augmented with the Solar Tower and Service Range. North and South Wings were added in the sixteenth century. Solar Tower. Built before 1343, this Solar tower is the largest such structure in Cumbria and reflected the wealth of its builder - Walter de Strictland. In 1306 he was made a Knight of the Bath by Edward I for his services in policing the troubled border region. The Stricklands were related to George Washington, the first President of the USA; in the fourteenth century Joan Strickland married Robert de Wessington from whom the later President was descended. North Range. 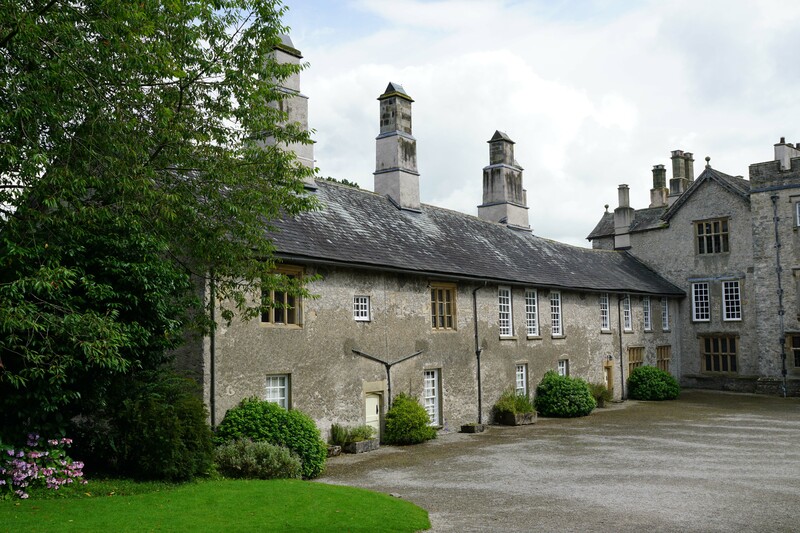 This originally hosted the ancillary buildings including kitchen and stables. South Range. This was used for high status accommodation. Hall Entrance. The entrance was restyled in the late nineteenth/early twentieth century. 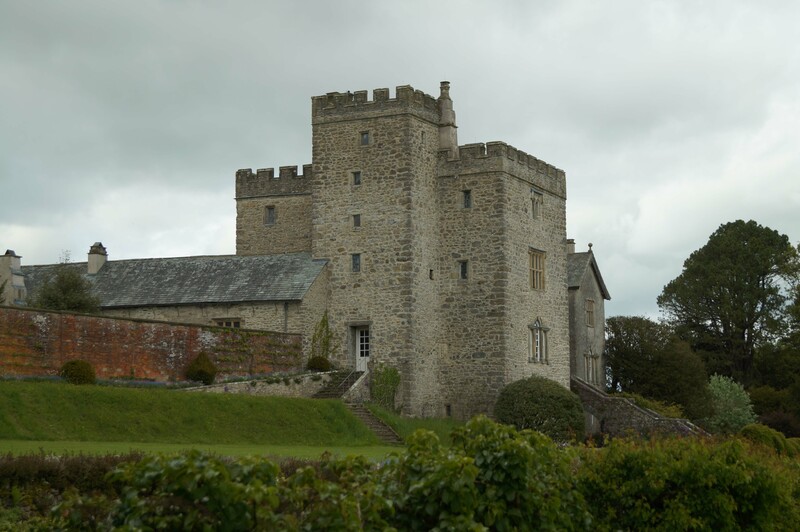 Sizergh Castle is found just off the A591. The site is a National Trust property and well sign-posted. There is a dedicated car park.